For over a century the cowboy has been the iconic American image recognized around the world, and the American “Old West” has been celebrated in art, music, literature, and of course movies and television programs. Long after the short-lived era of open range and long cattle drives came to an end, we still continue to admire and celebrate the stories and characters born out of that time. Popular representations may be more romantic than realistic, but they never seem to lose their appeal. I grew up watching Westerns on TV. The Rifleman, Wagon Train, High Chaparral, Rawhide and The Virginian were among my favorite shows. I liked the independent, self-reliant spirit of the pioneers, and the fact that you could always tell the good guys from the bad guys, and the bad guys always got what was coming to them in the end. I loved Westerns then, and I still love them today. 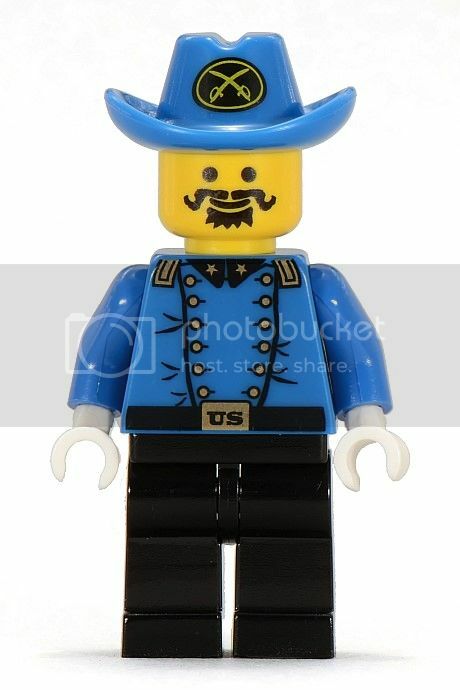 So I suppose it’s only natural that I find myself drawn to the LEGO Western theme. I missed out on the Western sets of 1996-97 because I was, sadly, still in my Dark Ages. But with the recent release of the Lone Ranger movie tie-in sets, it seemed like a good time to revisit the history of the Western theme. Perhaps knowing more about this theme in general will help us judge the potential returns of these new sets. Since I didn’t have the opportunity to own these sets myself, I’ve based my opinions about this one on research. I think this has given me a pretty good feel for what it’s like. The Frontier Patrol set, released in 1997, is a small set but an attractive one. It isn’t especially impressive by itself, but with 3 cavalrymen and a horse, it’s a nice army-builder set. 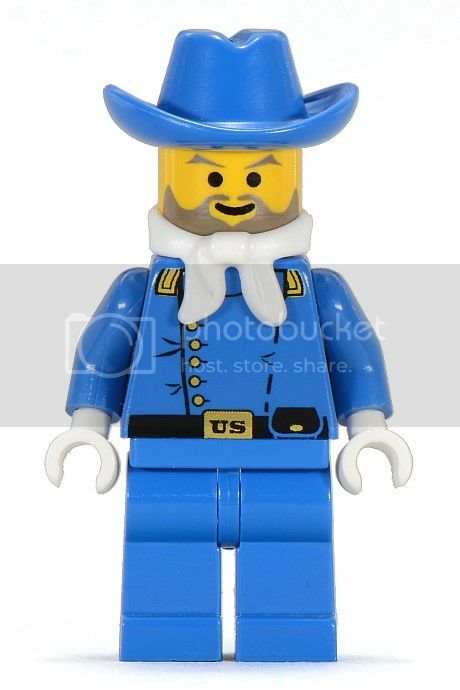 Frontier Patrol is made up of 3 minifigures: a Cavalry Colonel riding a black horse, a Cavalry Lieutenant, and a Cavalry Soldier. Accessories include two rifles, one pistol, a flag, a bugle, and a saber. It also includes a green bush. One of the more interesting pieces in this set is the dynamite, which is represented by a picture printed on a 1x2 white tile. There are no structures includes in this set. 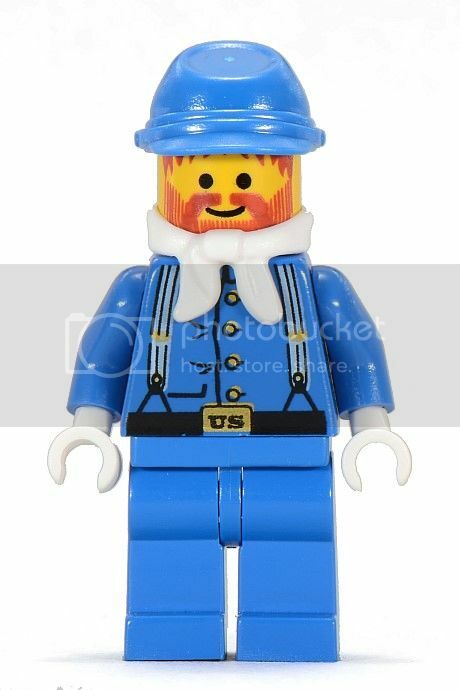 For purposes of comparison, I would consider it to be comparable to the current Lone Ranger Cavalry Builder set. At 26 pieces and 3 minifigures, this is one of the smaller sets. There aren’t any structures to build and it probably wouldn’t be a whole lot of fun to play with by itself, but the soldiers would make a nice addition to other sets to increase the overall playability of the theme. The original retail price per piece was 20 cents, which seems a bit high. But with this being a vintage set, the original price is no longer particularly relevant. At current prices (according to the BP LEGO Price Guide), the price per piece is $ 1.21 for new and $ 0.52 used. In other words, this is probably not a set you’d want to part out, in my opinion. Although this theme hasn’t been revisited since 1997 (except for a re-release of 3 of the sets in 2002), I think there’s still a strong inherent market for a Western theme. And now with the new Lone Ranger sets coming out, it’s very possible that many people will be inspired to take another look at these older sets. And if the movie is a big hit, I think it will provide a rising tide that will lift all the Western set ships, both old and new. This set was packaged in a box, with the standard “action” scene on the front. I think the artwork makes it look like a fun set and it would be attractive to potential buyers. As a vintage set, most of its growth potential has probably already been realized. That could change, however, if the Lone Ranger sets spark enough renewed interest in the Western theme to make the old sets more sought-after than they otherwise would be. For that reason, I didn’t give it a 1. This is one of the smaller sets in the theme. As such, it probably wouldn’t be particularly spectacular displayed on its own. But as part of a larger display, it would definitely be a nice addition. This is one of the better-performing sets of this series, with ROI of 463% and a CAGR of 11.4%. However, with an original price of $5.99, one would need to have stockpiled quite a few of these sets to make a sizable profit on them. The same would hold true for anyone purchasing it now as an investment. I don’t see any of the original Western sets as being a great investment at this point, as they’ve already seen significant gains. However, it will be interesting to see what happens with the new Lone Ranger sets. If they really take off, the older sets might benefit from renewed interest in the Western theme as a whole. Time will tell. I think this sets is certainly worth looking at as far as adding it to one’s personal collection. It would be fun to play with, and if combined with other sets would make a nice addition to a display. For this use I would recommend looking for used sets to purchase to save money.